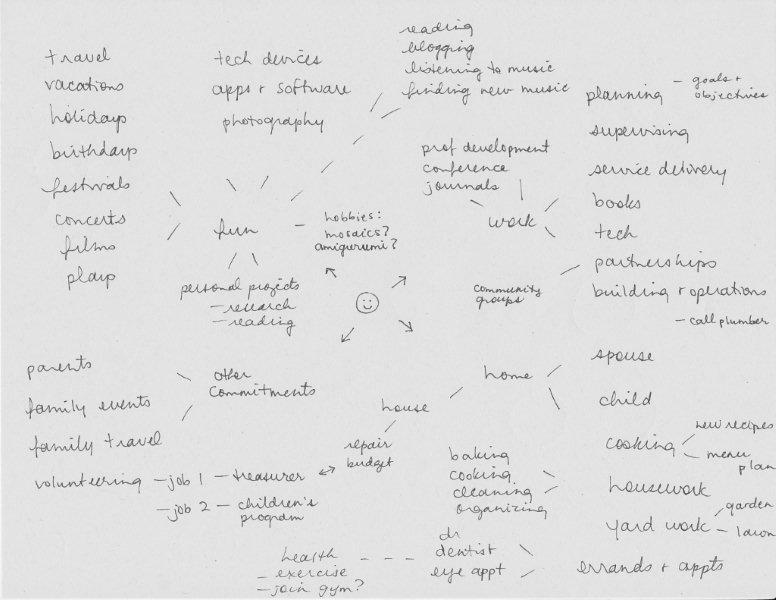 Every once in a while I make a mind map of my life – what I am doing and what I would like to do. It’s a way to be mindful about how my life is going, and to guide it. Serendipity has its place, but some discipline and “nudging” does, too! Sometimes I map to solve a problem, such as “How should I set priorities on my time?” Or, I do a round-up of my current situation and see where the exercise takes me. The key to success for me is to put myself at the centre of the map. Not my family or job or commitments. Sounds scary, doesn’t it – to make a big statement: “This is all about ME!” I think personal satisfaction and growth are paramount. If I continually minimize my own wants and needs, they will eventually surface in the form of resentment toward what others are “making” me do. I rate whether the “areas” of my life are balanced in a way I like, if they can be changed, and how. It’s like budgeting, really! Today I started with this diagram of the main areas of my life. When I say “areas,” I am referring to categories of stuff I do! In real life, nothing is segmented into areas quite so well…there’s an overlap between home and work, and technology in both, and health underpinning it all, and so forth. As I mapped everything, I got more specific, and it started to show how I spent my time. It also showed how I visualize and value each part of my life. For example, I didn’t put any bullet points next to my spouse and child on the second map – I don’t think of them as “areas” that require work! It’s not that I ignore them – just that they don’t need to be part of an overhaul of my life priorities! I was interested to see (after the fact) that I had grouped my life into the quadrants of home, work, other responsibilities, and fun. As it happens, I spend the greatest part of my time at work and on home-related chores. I see all of the work and home responsibilities as “givens” that I don’t need to dwell upon because they will always get done. I can see that “fun” is the area I most want to expand upon! Now I have grouped FUN into categories (sounds like something I would do, doesn’t it?) and I listed things I’d like to try. I’m ending my process here, because I have all kinds of ideas and enthusiasm. I will just pick something off the page now and again – and schedule a few as needed (like the photography course and the theatre subscription). Do you ever analyze how your life is going, or decide you need a shake-up? How do you decide what needs attention? I’ve actually just done a “5 Year plan”, and it wasn’t easy believe it or not. But I did it, and I just went for it, dreams and all… right there on paper. It was liberating and felt good and I left all sorts of room for change and development! I’ll have to blog about it soon, I love the visuals you used… all great! I think this is important for us all to do from time to time. 5 Year Plan – great idea! I have done that for budgeting but not for life goals. I look forward to hearing about it! I ALWAYS feel like my life needs a “shake-up”! I have overhauled my life so many times due to huge life changes that I don’t think that way any more – but I can always go for “tweaks”! I always love seeing people’s handwriting…there’s a lot of “personality” in hand-drawn diagrams. I love the way you have mapped things out, breaking down to increasingly levels of detail. It seems like a great method. I am constantly thinking of the “big picture” plan but I haven’t ever really mapped it out on paper. Instead, I seem to lie awake at 3am thinking about it. Perhaps a mind map would get the thoughts out of my head and let me sleep more peacefully. I am a fan of writing things down, perhaps because I grew up without a computer. Whenever I have a serious issue to resolve (this wasn’t one), I always write it out in some way. A pros-and-cons list, a list of options, a list of actions to take…eventually I gain clarity! This is a really nice idea and I bet helps you stay focused. I sometimes find myself writing lists to organise bits of my life like this but I think your approach may be more constructive. Make chaos and then make sense of the chaos! That’s a good way of putting it. Like doing a brainstorm, I like getting everything down first and organizing it later! 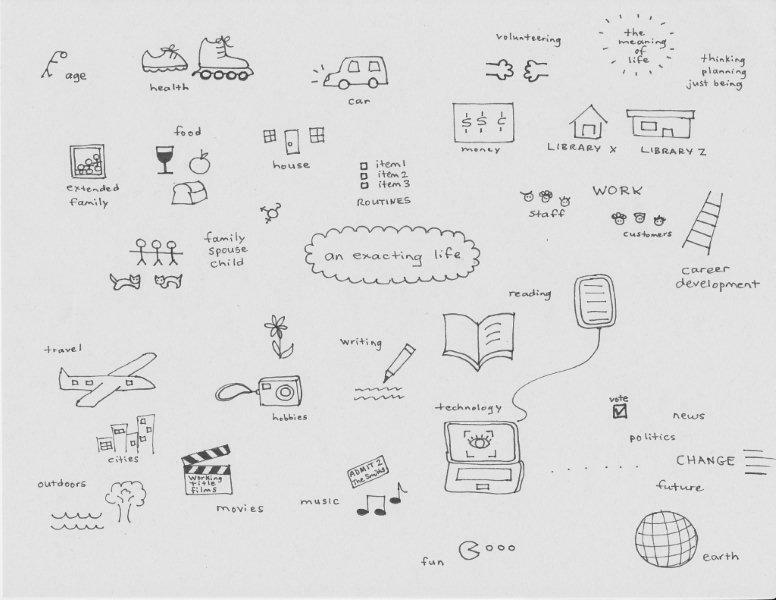 This is a great way to mind map. I hadn’t thought of doing it in pictures before, but it makes it very visual. I tend to plan for the long term, but this is something I might do to cover the next 6 months – I’m switching my planning from 1 year/5 year to 6 monthly/5 year because I think it will work out better for me/us. That’s a good idea to change the time frame, Laura. I am planning to do a budgeting exercise in pictures, too, because it might motivate me to “see” where my money is going! Love your mind map. I’m a list/dot-point kind of girl. My headings or areas – fitness, home and garden, leisure activities, social life/contact with friends, family, travel, finances. Thanks – I imagine that others’ headings could be very different from mine. I deal with people so much at work and volunteering that the rest of the time, I am rather solitary. I was wondering if I’d get any comments that my pets didn’t rate their own category! Hmmm, we are 4+ years to Hubby’s retirement and plan to sell our house and move at that time. I think doing this with a 4 year time frame would help. 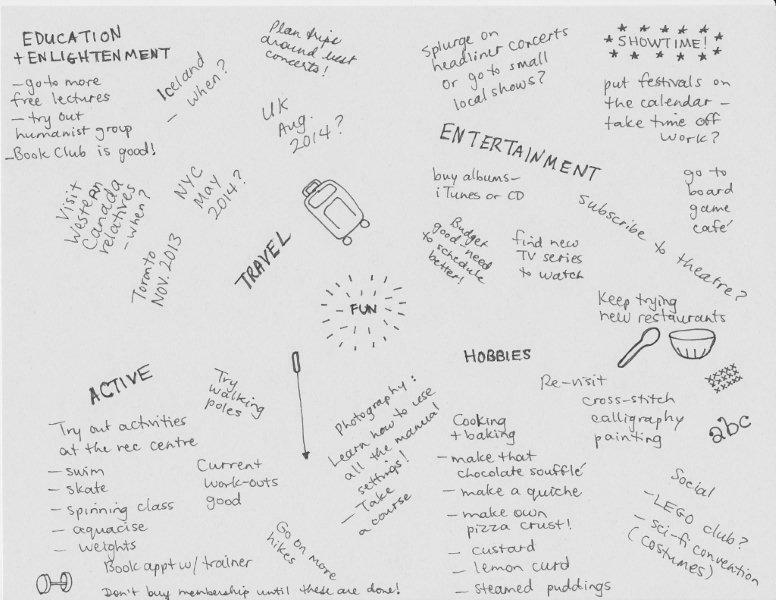 Great visuals – thanks for sharing your own mind map! Thanks – it would be fun to do this for significant goals! This is a great idea. I have been trying to overhaul some areas of my life for a while and haven’t been very successful. I do this kind of thing for my budget and financial goals but I have never thought of doing it for non-budget related goals. And I had never thought of using pictures or webs for my budget either! Love this! 🙂 You and I have some similar goals – a mentor of mine years ago had a subscription to our local theater and gave her tickets to me for one month’s show because something came up. I loved it! It reminded me of how much I used to enjoy going to see shows with my grandmother when I was little. Now hubby and I try to see at least one show a year. Even just one can be expensive, but we have such a good time! Thanks – I find that goals to have more fun are motivating! I had a subscription with a friend years ago, but now only go about once a year. So it is time for a theatre revival! I loved seeing your writing and pictures too! I need a shake up, which I think I’ve touched on a bit on my blog lately. I suppose I just don’t really feel like “me” at the moment, and it’s cause the ‘others’ are demanding too much imo. Too much time and brain power on work, and then I’m pooped, and everything else seems like an effort. I’ve realised I’m really missing international travel – I learn and grow so much, and it nourishes my soul. I did bring that up last night with the BF, but budget is part of the process, and I need to be sensitive to that (and time constraints, I somehow ‘earn’ more time off too). Anyhow, it’s interesting to see the things you’re wanting to pursue, I’m tempted to do one too! I wondered when you would travel again, since you’ve always mentioned how much you enjoy it, but we’ve never seen you in travel mode! It sounds like you are having some fun, though, with your bridge run and visiting friends etc. Hope you can create more of it! I did my own mind map on Monday night too! And I’m going to at least plan travel itineraries (come on, that’s why one has a blog right?) and see how I go… it’s a step on a path to a great holiday! Love the visual representation of your “exacting life”! Not only does it look like you are truly able to focus on where you are and where you want to be, it’s also a great way to memorialize this period in life. Thank you for sharing! Thanks – this is a good time of life. I have mapped some unhappy times, but it did help me find the way out. My quest for finding more fun activities is a good problem to have! Love the mind map! Ive tried such a thing (but not as nice looking as yours!) and it really does help me “see” my life on paper! Thanks; I like it more than a list when I really want to take action. Maybe it’s because it’s not designed to be checked off, but explored! It gives me the feeling of being able to go on and on, rather than coming to a dead end. I always liked writing – putting pen to paper. I’ve done mind mapping and like it to help me get stuff out of my brain so I can organize my thoughts. I retired in November. Hubby’s been retired for 9 years. Mom (age 86) has lived with us for 6 years. After a month of floundering here trying to get a grip on my “new” life – I sat down and mapped my thoughts which resulted in creation of my 2013 goals. I listed my 9 goals in a spreadsheet with a description of what each goal would look like when accomplished – then created a separate spreadsheet for each goal – listing steps toward that goal. I added a “weekly status update” spreadsheet with a column for each goal – to track my progress. I also added a spreadsheet for my “dashboard” – my daily “to do” list. I refer to it periodically throughout the day (morning/afternoon/evening) to make sure I get things done. (Am I drinking enough water? Did I give Mom her meds? Have I spent time de-cluttering or deep cleaning in the room of the week? Did I get in some exercise today? Is it time to change the A/C filter? etc. ) All these spreadsheets are in one master Excel workbook. Each Sunday morning – coffee in hand – I review my progress from the previous week and plan the next week. I’m not ashamed to admit… I even give myself “happy faces” when I’m particularly pleased with my progress. It’s working great for me. I’m getting things done, but not feeling over-worked or behind – and still have time for my hobbies. After all – I retired to spend more time doing what I like. One of the best things I’ve done and I know this because I’ve kept it up for 10 months straight now. Okay – I was a planner in my former work life and it’s how I operate best. I think you have a wonderful system. I am currently working jobs in 2 locations plus a volunteer job and home stuff, so I am looking for a master planning system that I can view from any of the sites, Maybe I could do a workbook in Google Docs or something like that? I use Dropbox and password protect documents. I like Dropbox because it’s free and I can share links to documents from there. I like being able to click on the Dropbox icon on my desktop and see all the files without having to “go to the internet to log on”. So – I’m actually working off the file stored on Dropbox. I’m sure other cloud storage systems work the same – but Dropbox has a simple layout and works for me. I will have to think about that because I use 3 computers each day in 3 different locations. I looked at Google Docs. I think that’s your best bet. Thanks for checking back in – I respect your opinion! I definitely cannot get the hang of these mindmaps – my hubby does them and then I come along and have to convert them to a list to understand them!! I frequently do an exercise called ‘what time is it in my life?’ where I liken my life at the moment to an hour in the day – it can be quite enlightening. Sometimes I can feel very optimistic like it is a bright sunny morning full of promise or sometimes when responsibilities weigh me down it can feel like those dark scary hours of the very early morning – whatever I discover is my catalyst to bring about changes in my life. I like your way of visualizing things. I use a mind map to get ideas down, but once I get to the detail stage, I switch to lists! I did get a book out once from our library on Mindmaps – it was very interesting and I had a go but somehow I just end up with a another list in disguise! You seem to have got the hang of it. 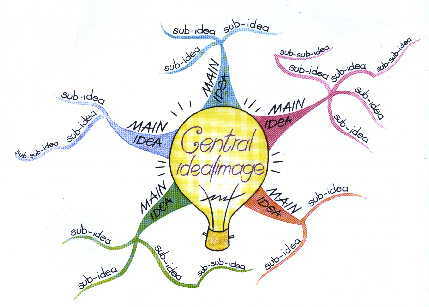 There is a program called MindManager that makes “mind maps”. My boss would use it all the time to organize what projects he gave us to do in the lab. I watched a YouTube video about that just now; it looks like a great product for working in groups. Thanks!